Hardback, 10 x 12 in. / 224 pgs / 70 color / 100 duotone. Fiction by A.M. Homes. 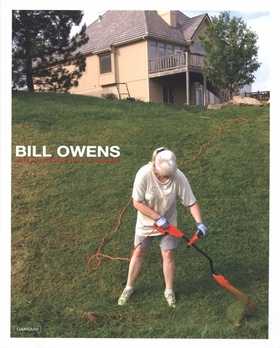 Text by Bill Owens, Claudia Zanfi. A black-and-white photograph captures a woman, curlers in her hair and a baby in her arms, standing in a messy kitchen and saying, “How can I worry about the damned dishes when there are children dying in Vietnam?” California photographer Bill Owens is best known for his critically acclaimed series Suburbia, which was published as a monograph in 1972, and has long been considered one of the classic photo books of the era. For this influential and evocative project, Owens simply shot friends and acquaintances in his Livermore, California, neighborhood and allowed them to speak for themselves. Ordinary people had rarely been so riveting. A comprehensive monograph, this volume consists of several sections of work from 1969 to the present, opening at the height of flower power, with images of the Beat generation, Woodstock and the protests against Vietnam. Owens has always remained intrigued by America as a subject: there follows a series of images focusing on urban America, its endless grids and homogeneous cities. In his most recent photos, many of which are in color and previously unpublished, Owens reveals how suburbia has evolved in the last 40 years--from the friendly place he captured in the 1970s to one characterized by sprawl and anonymity. FORMAT: Hardback, 10 x 12 in. / 224 pgs / 70 color / 100 duotone.